I remember first reading about dinosaurs in encyclopedia with my Little Angels and found ourselves to fascinate and in awe to see creatures far larger than any today with some fierce carnivores, while others were gentle. Instead of letting my Little Angels to be manipulated by smartphone or tablet, Mommy Jane will always look for something related to dinosaurs for a family time. When Mommy Jane heard that a Dinosaur themed park will be opening soon at Semenyih, Mommy Jane had joined their press conference at Setia Eco Hill Park which is their venue sponsor to be the first to get all the information. Themepaktu Dinosaur Kingdom is the modern age of mobile theme parks with educational activities, entertainment and more. After attending to their press conference, Mommy Jane found out that the parks looked cool, interesting and it will capture our iGeneration's interest. Mommy Jane will explain some of the interesting activies at Themepaktu Dinosaur Kingdom. First is the 5D Cinema where we could go on a wild adventure which features 5D rides in Rexy's Journey & A Dark Adventure. You could also go for a spin around the Drift Island and show off your driving skills to the native Triceratops herd. At Raptor's Maze, do take on an adventure of a lifetime in search of the hidden key in Raptor's Maze to free yourself, your friends and family members from the deadly maze. Beware of Raptors !!! Calling all young adventures ! Are you ready to conquer the peak of Pterosaur's Nest ? Be warned coz' this is not a treat for trembling climbers ! For those who want to win some prizes at Themepaktu Dinosaur Kingdom, just record a song cover video of their Dinosaur Kingdom theme song "We Are Super Dinosaur" with 19 of your friends and email to them. 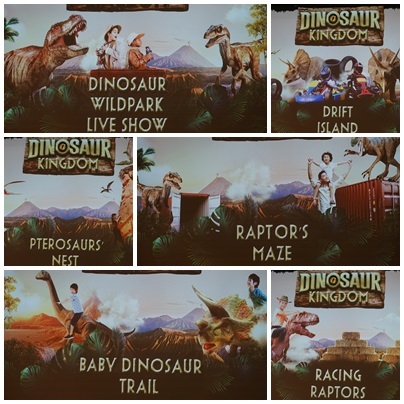 Videos will be uploaded by them to their Facebook page using the hashtag #DinosaurKingdom #WeAreSuperDinosaurs #(Your Kindergarten Name) and everyone of you will stand a chance to win free tickets. They will even provide a free bus ride for the winning team from your school directly to Dinosaur Kingdom. Show Some Love and pledge RM80 to provide a fun edutainment time for an orphan with them. For every pledged by the public, Dinosaur Kingdom will pledge for another orphan too. Do share out our love and joy to the orphanage now ! The entrance ticket to Themepaktu Dinosaur Kingdom at Setia Eco Hill Welcome Centre Semenyih is at RM30 per person. For RM50 package, it will include 10 tokens. For Family of 4, the price is at RM100. Group purchase is available. Tickets can be purchase through Themepaktu apps and their website. Themepaktu Dinosaur Kingdom will be opened on 14 June to 8 July 2018 from 12 noon to 10.30 p.m. daily. Dinosaur Wildpark Live Show will be available at 1.00 p.m., 3.00 p.m., 5.00 p.m. and 9.00 p.m. Dinosaur Kingdom Parade will be available at 6.30 p.m. Super Dinosaur's Appearances will be at 12.30 p.m., 2.30 p.m., 4.30 p.m., 7.30 p.m. and 9.30 p.m. For showtime schedule, free tokens, Dinosaur eggs hunt adventure or the event site map. do download Themepaktu Apps at Google Play Store and App Store for free. You could make your purchase through the App too. After joining Themepaktu Dinosaur Kingdom press conference and touring the site, Mommy Jane was assured that the theme park will create an impactful content with a lasting memory. It is a trend in demand and will last for another few years. Besides Setia Ecohill Semenyih, there will be few more locations in the pipeline and hopefully they will come to KL soon to save our travelling times. Mommy Jane definitely will bring Little Angels to Themepaktu Dinosaur Kingdom for them to experience the life of the Dinosaurs and to join those interactive and edutainment activities that will helps them to understand the Dinosaurs more. Ayu, kids sure love it. There are lots of activities available too. I would say that even the adults would be more than happy to be there too. I know I would. Rawlins, I would be happy too coz' when I was a kid, we seldom have this and it reminds us of our childhood when we wonder how is it really looks like. I am sure the kids gonna love this plce. Not just the kids, but i also would be happy to be there too. I will come there with my nephew and niece. Zharif, it will be a wonderful experience to enjoy it together. wow the dinasours looks real! i bet not only childrens but their mom and dad also will love it! Right? Mimi, you should. It will helps them up in their growing up period to clear their curiosity on dinosaurs that had existed before. Wow love to explore all types of dinasour. This place just not for kids , it's for adult too. Everything looks exactly like real dinasour . Rane, bring them over. They will learn to love it and play with it. It will be a fun time with family. Betty. at Themepaktu, there are few activities that we can have it with the dinosaurs. It will be fun.